For serious softball players only - FASTBALL / CHANGE UP in one set up! Bata builds the best. Shipping 75.00 Lower 48 States. For serious softball players only - FASTBALL / CHANGE UP in one set up! 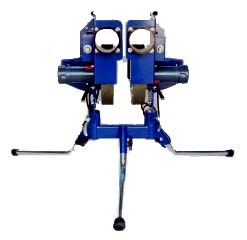 The BATA-1 TwinPitch Softball Pitching Machine does what no other softball machine has done before. It gives you two pitches in one set up. When used with the new Toggle Manual Pitch selector (sold separately), the batter cannot predict which pitch is coming. When manual feeding, the T-shaped Toggle Manual Pitch selector is set to either side. Left for fastball. Right for a change up. Two downhill feed chute extensions are connected to the in-feed chutes. Two balls are rolled down the feed chutes at the same time. The batter can see the balls roll down. Both balls appear (visible tithe batter) just before the pitching wheels, but only one comes out.